With my children at their father’s, my OH away in Italy working, I am having a peaceful and quiet Easter weekend. I love my own company. My younger DD wonders what I am going to do with my time, but I love the space and quiet, probably a bi-product of being an ‘only child’. He was chuffed to get inside. The church was warm, you could smell candles had been burned this morning at the Easter service, the place was beautiful and had the feeling of warmth and community. 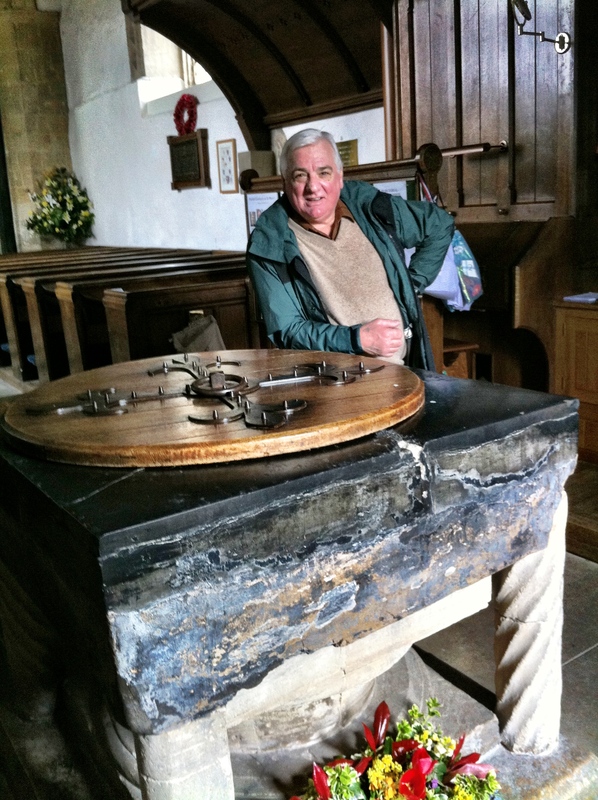 The font was there, here he stands by it, some 66 years after he was christened here, 70 years ago my grandparents were married here and much earlier my maternal grandparents too. It was lovely. There was the lane where he had taught my mum to ride his Lambretta, where she and him had crashed into bars as she ‘couldn’t turn corners’. And the bushes where the Americans would take their girls for a ‘roll in the hay’ whilst out rowing, and in which my dad and his pals would seek out lost money and zippo lighters. We ended up for lunch in a pub back in Iffley Village, after walking through Christ Church meadow, along the Iffley Road, past the running track where Bannister had run the 4 minute mile. Past the church where my aunt had been married, and my dad had bashed his car on an uneven manhole cover, and at which my mum had been described as ‘the gorgeous girl in red’ by his cousin, Mum proudly added ‘That was ‘the red Chanel'” with a proud, smug grin. We also passed his old school, and countless houses where ‘Bobby Smith’ ‘Jonny Norman’ et al had lived in those years ago…. The pub in Iffley village served us a wonderful roast dinner, and scrumptious puddings. And then we came home. I loved today. Posted in Diary Entry and tagged Church, easter, Iffley, maternal grandparents, memories, Oxford, Walk. Bookmark the permalink.